Chapulines are frequently consumed on the street when purchased from vendors in or near Oaxaca's markets, or from itinerate saleswomen plying their product to passersby on the sidewalks and pedestrian corridors in downtown Oaxaca. However they are also a popular menu items in both middle-of-the-road and high end restaurants not only in Oaxaca but in other parts of Mexico. 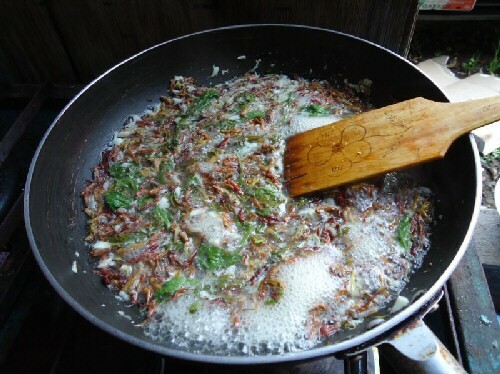 Chapulines are usually served in Oaxacan restaurants as part of a mixed appetizer plate along with one or two locally produced cheeses, Oaxacan sausage (chorizo), spiced peanuts and crackling pork fat (chicharrón). At fiestas, from the most humble rural function to the most lavish high class event, a mixed botana plate which includes chapulines is commonplace, often expected, and always enjoyed. The high protein high jumper has also become popular as an ingredient in more upscale Oaxacan recipes, such as in dips and stuffing. With the large operations there is less likelihood that insects other than grasshoppers, and unwanted grasses and small leaves will find their way into the nets. The same holds true of small scale production later in the season when they are harvested from amongst vegetable crops. It's small scale early season harvesting of chapulines which results in the occasional trapping of other small creatures such as larvae, locusts and other unwanted guests as well as thistle, small weeds and leaves. When this does in fact occur more attention is required when preparing a chapulín recipe. NOTE: Since I have never tried this recipe with any insect other than chapulines from Oaxaca, Mexico, I'm uncertain as to whether small Canadian or American grasshoppers will turn red or have as agreeable a flavor. Regarding the latter, it all depends on the chapulín's diet, climatic conditions and other environmental factors. Alvin Starkman together with his wife Arlene operates Casa Machaya Oaxaca Bed & Breakfast. He is also a partner in Oaxaca Culinary Tours (http://www.oaxacaculinarytours.com) with Chef Pilar Cabrera. Alvin assists visitors to the central valleys of Oaxaca to plan their vacations. He is an avid aficionado of mezcal and pulque (http://www.oaxaca-mezcal.com). This page has been visited times since December 22, 2013.